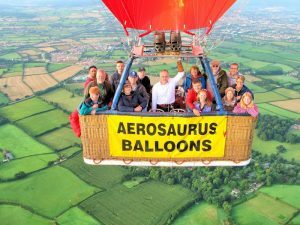 You may have seen the Aerosaurus balloons floating along 2000ft above the landscape, but have you ever stopped to think about how they work? This is the top part of the balloon, the fabric which becomes inflated and contains the hot air. Envelopes are usually made of ripstop nylon, which is highly resistant to damage. Balloon envelopes carry the balloon artwork or branding, and can also made into countless different shapes. Read more about special shape balloons here. Liquid propane is mixed with air and ignited by the burners, which direct the flame towards the envelope. This heats up the air inside the balloon and allows it to expand to provide lift. This is the part of the balloon which holds the pilot and the passengers. Balloon baskets are usually made of woven wicker which is both light, and also highly durable which enables the basket to withstand the pressure exerted on it during the flight and when landing. Baskets come in many sizes, and at Aerosaurus we have baskets which hold anywhere between 2 – 16 passengers plus the pilot. Some baskets are split into sections which separates the pilot and burners from the passengers, and provides structural bracing. How does the balloon fly? The envelope is laid out flat on the ground, with the basket on its side, and then cold-inflated with air using fans. The burners are then switched on to heat up the air inside the envelope, which begins to inflate and rise up off the ground. 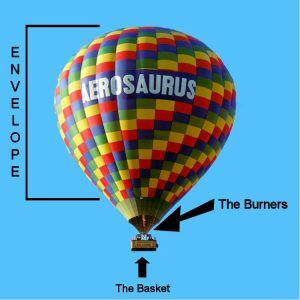 The hot air inside the balloon envelope is lighter than the air outside of it, which allows the whole balloon to lift off of the ground and float into the skies. The pilot can control how high the balloon is flying by either heating up the air inside the balloon using the burners to increase altitude, or by releasing hot air from the top of the envelope to decrease altitude. Can a Hot Air Balloon be steered? 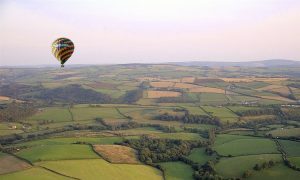 Because of the way which hot air balloons work, it is not possible to fully control the direction in which it flies. The pilot can partially control the balloon direction by changing the altitude at which they are flying. This is why each flight with Aerosaurus Balloons and Bailey Balloons is unique, and will follow a different flight path – we can’t guarantee exactly which landscapes you will see on the day, but we can guarantee that the view will be beautiful!